A piece of cosmic truth - hail our gelatinous overlords! So, we begin this pdf, in the tradition of Rite Publishing, with an expertly-written piece of in-character prose: “Glub.” The sheer brilliance of this reduction of the conditio pituitae in a manner of linguistic atomization should be considered the ultimate piece of flavor – nowhere else has the sheer courage to express the fundamental truth of an existence been so brilliantly crafted in such a concise way. When the further physical descriptions and society/religious stances of gelatinous cubes are elaborated upon in a repetition of said sequence of letters, duplicated and then, disintegrated beyond guttural sounds, one cannot help but notice the very limitations our own fragile language imposes on communication, rendering the feeble attempts to convey an existence’s experiences moot. Within the absolute reduction executed here, truth of cosmic proportions can be found – up to the cutting off of humanoid screams, for, in those sounds, life lies and the death awaiting at the end, beyond the veil, ultimately comes for us all, while the ooze’s eternal truth remains, transcending the bounds of mortality and subjectivity, a zen of slime, a slimy nirvana of the ooze is all that remains. I hesitate to descend back into the nit and grit, the profane simplicity of language, but for the purpose of providing a guidance for all of us unenlightened accumulations of cells, I will…thus, the conventionalizing racial stats provided would be +4 Con, -2 Int, Wis and Cha – obviously a nod towards the mental capacities ultimately ending up as detriments to one’s own enlightenment and the eternal perpetuation of one’s genetic make-up. The same can obviously be said about fast movement – 15 ft and a slow, but steady movement towards one’s foes is more than sufficient, since a undue hastening can be considered ultimately an acceleration BEYOND the ability to grasp the intricacies of the moment, of the fleeting “now” that is eternally transformed into the past. Since sight and similar senses are the purview of lesser creatures, blindsight is not a surprise here, either – the senses, ultimately, do convey an individual Rorschach-test of reality, after all. The perfection of a cube’s essential form, as handed down by philosophers older and wiser than I can ever hope to be, obviously allows them to literally carry us feebly humanoids within their very frames, though obviously, mortals may be endangered by the stripping of primitive components of their physiology – like skin. Being beyond classes, these paragons of evolution and form obviously cannot advance in classes beneath their power and yes, they are transparent, for there is nothing in substance and substance in nothing. The blasphemous notion of a limited existence and the weight of these creatures has been provided alongside obvious benefits to be gained from following the paragon path to transcendence. 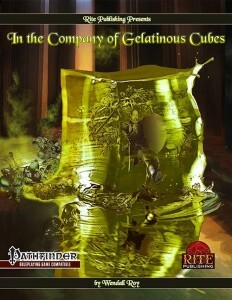 Being beyond the concern of paltry saves, gelatinous cubes thus do not progress much in this category. At 3/4 BAB-progression, d8 and 2+Int skills per level, there is not much to be done except reducing all those distracting choices to a minimum. At the same time, these glorious zen-masters of enlightenment may deem to adopt an adventuring ally among the less blessed races and at 2nd level and every 2 levels thereafter, the cube may select special ooze abilities, which include BAB-based attacks that negate incoming assaults (all is nothing, nothing is all, remember! ), compress forms (size is an illusion) or corrode things (all is vain!) – ultimately, there is a lot of wisdom and different truths to be unearthed here. Now once your existential anxiety reaches its peak, around 5th level, you’ll be happy to know that the cube’s anesthetically potent properties may literally take your pain away and free you from the chores of all those annoying choices – potentially permanently. Of course, if you get past this stage, you’ll experience growth alongside your cube’s literal ascendancy to a more significant bodily representation – usually around 7th and 15th level. Particularly adept cubes may elect to choose one of 3 unique feats to help the few mortals beyond their grasp see the truth they represent more clearly. Editing and formatting bespeak the superiority of the cubical masters. Layout adheres to a two-column full-color standard -and each page is rendered as a square, the basis of a cube! If you take the content-bearing pages, you can make a full cube – + an extra page, representing your task, nay, calling, to complete what these pages set up right before you. The pdf comes fully bookmarked. You can get this piece of cosmic truth here on OBS and here on d20pfsrd.com’s shop! *This is an April’s Fool-product and it’s hilarious. My review reflects this and I sincerely hope my little exegesis made you smile. Furthermore, while the tone of my review may be humorous, the verdict indeed describes what I think about this funny, nice book. While not a good option for a PC, it makes for compelling NPCs and remains an excellent offer at a low price.